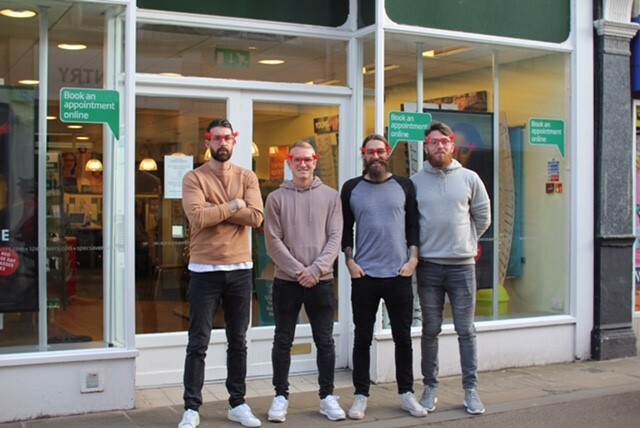 Stroud Specsavers encouraged children to celebrate Red Nose Day this year by designing their own Comic Relief glasses, raising £550 for the cause in the process. The team on King Street offered a family ticket to a Forest Green Rovers FC home game for the best entry, with all proceeds going to Comic Relief. ‘We saw some really creative entries,’ said store director Rizwan Choonara, who was one of the judges of the competition. ‘We wanted to include our younger customers in this year’s Comic Relief fundraising and thought this was a great way to do so. Rob Sinclair, Marcus Kelly, Sam Wedgbury and Sam Russell from Forest Green Rovers all popped in to the store to show their support.